If you’re cheap, you have money but won’t spend it until you’re forced to. When you’re poor you simply can’t afford spending beyond your necessary living expenses. But as a Minimalist you have money but don’t spend it unless the expense is practical, essential, or if it reflects positively on your minimalist identity. 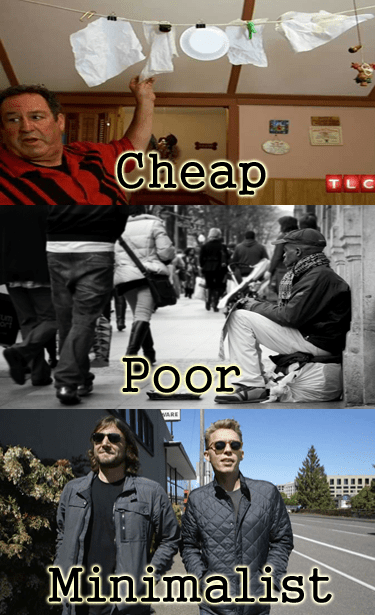 So are destitute and cheap people considered minimalists? After my recent viewing of the Netflix documentary on minimalists, I suspect not. The motivations for each group contradict one another. Poor people cannot afford to be minimalist because they don’t have the choice to limit spending. And cheap people don’t necessarily ascribe to the significance of minimalist philosophy. From what I’ve witnessed of this trend, it appears that in order to be a pure minimalist, certain boxes must be checked. I’ve prepared a test which you can do in the privacy of your own home. Were you a high income corporate exec, preferably in Manhattan or San Francisco? Did you sell all, or most of your stuff? Have you decided to move into a “tiny” house, camper or apartment? Do you believe that by reducing your material wealth you are living more meaningfully? Do you now tour the country espousing the virtues of minimalism? If you checked any of these boxes you may be a minimalist (or a monk). What bothers me about this movement is these so-called minimalists may identify as the “have-nots,” without experiencing the struggle that follows. Identifying as a “minimalist” is cool! My instinct is that most self-identifying minimalists live in safe communities, have health insurance and can afford to keep themselves fed, housed and clean. What I’m getting at is that the term minimalism has transformed from a conscious effort to reduce extravagant spending, into a lifestyle choice for adventurous young bankers who aspire to be digital nomads. Have you ever heard someone refer to a migrant farmer as a minimalist? Also, where do they draw the line? Is someone who lives in a tent more minimalist than someone who lives in a tiny house? Their carbon foot print is smaller. If I haven’t quit my finance job but follow a philosophy of restraint, can I still be a minimalist? Defenders of the movement would probably tell me that I don’t have to quit my job to self-identify as a minimalist. However, I suspect that, as in all groups, there is a clear hierarchy in place. The prophets of minimalism are tribesmen, Rousseau’s noble savages. I suppose there is nothing inherently wrong with the fact that minimalists fit a certain mold. But, I don’t appreciate the sense of shame that inevitably trickles down to non-minimalists, who are presented as mindless consumers driving the evil capitalist machine (and subsequently the booming economy). I practice restraint in my spending and tend to make purchase decisions based on needs, rather than desires. I also think that others would benefit from spending less, if only to retire at a reasonable age. However, I won’t be referring to myself as a minimalist. I’m not sure if I am allowed to anymore. We need a good 13-syllable German word for the phenomenon at the root ( as I see it) of your criticism of minimalists here. Oooh, I’ll have to check out that Netflix documentary! I’ve never identified as minimalist because I do like to hang on to items that might be unnecessary now, but helpful in the future. It’s like a selective form of being a packrat, I suppose. I think it’s frugal to hang onto, say, an unused microwave for a little while because you might need it (we’re kicking ourselves right now for donating an old microwave that we now could use at hubster’s office).